Greetings Divas and Gents! I know it is really late, but there is something laying heavy on my chest and I feel like I need to get it out before I call it a night. This evening I had the pleasure of watching history unfold. Tonight, I joined millions of other viewers as we watched in awe while Miss Gabby Douglas vaulted and beamed her way into the record books. This evening, Gabby took the top prize in the Women's Gymnastics All-Around competition at the Olympics, a feat that makes her the first African-American to do so. 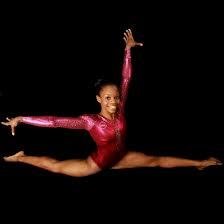 As I sat on the sofa stalking my Twitter feed and watching Gabby tumble her way to greatness, I started crying. Crying real tears! But my tears weren't just because I was ridiculously happy for and proud of Gabby. I was also moved at the thought of this 16-year-old champion's demonstration of what it means to be a role model. Gabby's accomplishment reminded me of an issue that I believe is crippling many young women in this country: recognizing and identifying role models. Let me back up for a second. Over the past couple of months, I have had somewhat of an awakening. I think it all started when VH1 started showing promotional footage of the upcoming season of Basketball Wives. Now, prior to seeing these promos I was all into the reality show circus. Real Housewives of Atlanta, Basketball Wives, Love and Hip Hop...I watched them all! And not only did I watch these shows, but I actively discussed all of the foolishness and drama with my family and friends. I watched these shows simply because they were entertaining and made for good conversation. Then it happened. When VH1 started airing commercials for the new season of Basketball Wives, I was mortified when I saw one of the cast members jump on and walk across a table to attack another woman...I was DONE! As an educated and well-raised black woman and professional, I could no longer justify seeing minority women physically fight each other on television (among other foolishness) with the entire world watching. Like I said...I was DONE! But guess what...even though I was done, the press was just getting started. My innate mortification was kicked into overdrive not too long after my "doneness" when I came across a Vibe Magazine cover proclaiming several female reality television stars as the "New Role Models." I gagged! Why you ask? I gagged because at least 2 of the 4 women on this magazine cover have generally displayed behavior unbecoming of a role model. Think about it...one woman was the aforementioned table jumper, and another is infamous for attacking a woman at a friend's freedom party. Vibe...you can't be serious. Who cares what the actual article says when the headline and the message on the cover is so jarring...and so far from the truth. Or is it? The hard and ugly truth is that these women are considered role models. Young women in urban areas all over this country are flocking to the message being sent by these women and their enablers: act up in public and you will be rewarded with a television show, fame, money, and VIP status at the hottest clubs in the hottest cities. Come on now! Where's the reward for good behavior, hard work, and legitimate success? Why isn't this being displayed as prevalently as the raggediness? I previously refrained from commenting on the Vibe Magazine cover when I first saw it, but Gabby's victory this evening has given me a perfect foil and starting point for sharing my real thoughts and concerns about the cover. Unfortunately, we live in a society where our youth are consistently getting it twisted. Young adults are erroneously buying into the nonsense that is being displayed in abundance on television and in social media. Young women, specifically, are mislead into believing that the actions and activities displayed by the cast members of Basketball Wives, Love & Hip Hop, and other reality shows are acceptable...and magazine articles highlighting and glorifying the perpetrators of these actions and activities are validating their behavior in the eyes of these young women. Am I the only one who has a serious issue with this? Now let's turn to Gabby. Here we have a young lady who has displayed good behavior, has put in hard work, and has experienced an unbelievable amount of success as a result of her good behavior and hard work. Gabby is a true role model in every sense of the word. At the young age of 16, she is a better role model than 90% of the women that regularly appear on these reality television shows...maybe more. Isn't that insane!? I thought we were supposed to get wiser with age. The real unfortunate thing is that many young women do not, cannot, and will not recognize or identify Gabby as a role model. They've been programmed for so long to spot faux role models that the real thing has gotten lost. Case and point: instead of focusing on the monumental accomplishment that Gabby achieved this evening, these "lost ones" chose to focus on her hair, her skin color, and her makeup. I really need folks to do better! I sincerely hope that young women all across this county sat down this evening and took notes on the characteristics of a true role model. Just in case they did not, let me run it down. - A girl who at the age of 14 left the only home and family she knew, and traveled across the country to train to be a champion. - A girl who loves and respects her mother and siblings, and who has worked tirelessly to help make a better life for her family. - A girl who helped her team win the gold medal in the 2011 World Championships through hard work and dedication. - A girl who at the age of 16 won a spot on the U.S. 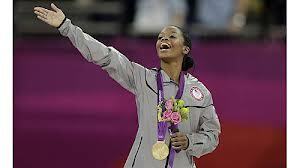 Gymnastics Team, and led her team to win the first team all-around Olympic gold medal for the United States since 1996. - A girl who at the age of 16 became the first African-American or woman of color to win the individual, all-around Olympic gold medal. - A girl who at the age of 16 demonstrates the poise, confidence, and maturity of a true champion. - A woman who climbs on a table, and walks across said table in an attempt to physically hurt someone. - A woman who, in public or in private, tosses a drink in someone's face and/or direction. - A woman whose ultimate goal in life is to inform everyone of her clothing and shoe designers. - A woman who is a bully, and who has to put others down in order to feel good about herself. - A woman who places a greater value on things than people. Once again, congratulations Miss Gabby Douglas, and thank you for showing an entire generation of young women what it means to truly be a role model. to realize that they witnessed history because they were focusing on a messy bun. It's a shame. I'm blessed because my kids saw what hardwork, dedication, and faith will accomplish. Go Gabby Go!